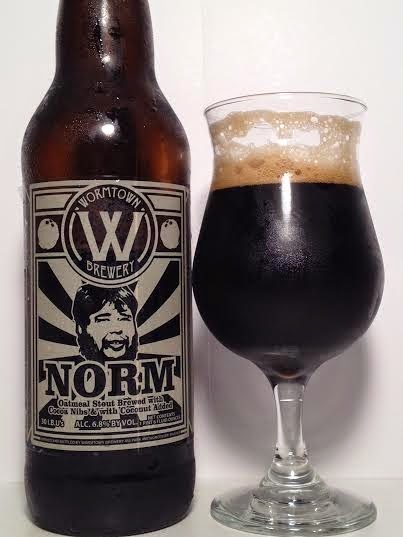 Back in 2012, Wormtown Brewing brewed and named a coconut stout after Boston beer blogger and author Norman Miller. "Norm" is an Oatmeal Stout brewed with cocoa nibs, 10 specialty malts, and a pound of toasted coconut per gallon. Funny sidetrack story if I may. I first met Norman Miller back in June at Nigh Shift Brewing where he was signing copies of his latest book (which you can get here). I didn't put two and two together that he was Norm from "Norm". Then last month when my friend Ryan and I were on a visit to Jack's Abby for the Coco-Nut Framinghammer release, Norman Miller walked in and picked up his beers. Also at Jack's Abby was a copy of Norman Miller's book. I told Ryan that was Norman Miller, the author of that book. He then said he looked an awful lot like the guy on the bottle of Wormtown's Norm. Then we looked at each other in shock as we had the same exact epiphany at that exact moment. Yeah, nothing gets past us. Ok, onto the beer! Pours pitch black like any good stout. I had to let the 3-4 finger, khaki head settle before I could fill up the rest of my glass. This is the epitome of a "dessert beer". Roasted malts up front followed with a gush of chocolate and coconut. Combined, I also pick up a marshmallow flavor. Liquid Almond Joy is all I need to say. The coconut and cocoa nibs assault your taste buds in a glorious way. It is incredibly sweet at the front of the tongue with those aforementioned chocolate and coconut flavors. On the finish it is all bitter, roasted malts. All sweet, awesome flavor aside, if I have to criticize anything, it is the semi-thin mouthfeel. Granted this isn't an imperial stout and by definition isn't as heavy, but it does take a small bite out of the body. That being said, it still is super robust and fluffy on the tongue. No need for dessert because Wormtown Norm will satisfy any sweet tooth. Why more breweries don't try and make coconut stouts is a mystery to me as it has been a winning move in my experiences. All of the flavors promised are heavily present on the aroma and taste and they do not disappoint. If you melted an Almond Joy, I'm sure you'd get the same satisfaction. It's complex, tasty, and drinkable, which makes it a nearly perfect offering. While a slightly thin mouthfeel holds it back from perfection, don't you dare let that deter you from picking this up when available. As far as I know it is a Massachusetts-only release, and a limited release at that. Outside the Commonwealth it will require a trade and even inside it's hard to track down. If you do see it, grab it and hold it tighter than your true love. Pretty deep, right?